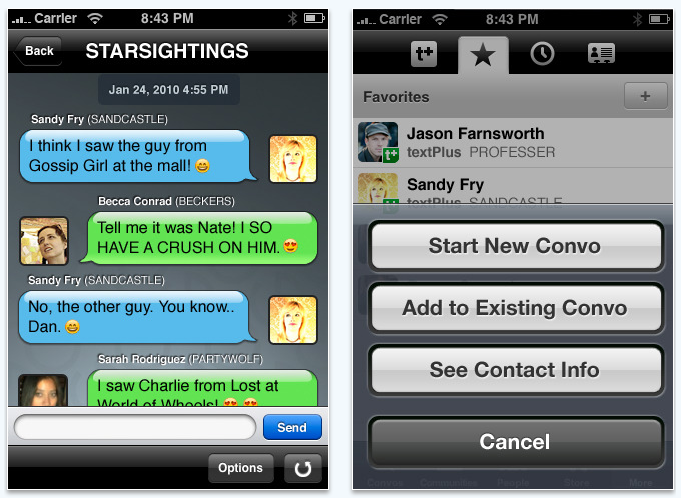 Are you interested in sending text messages often through your iPhone? If yes, textPlus from GOGII is committed to bringing you free, sponsor-supported texting & real group conversations to the iPod touch, iPhone & iPad. Of course the highlight of this app is, it supports iPod touch very well! TextPlus allows the users to send and receive unlimited free text messages without using a cellular network. Once you get into the app it takes you to the “Convos” option in which you can see the recent chat between you and the recipient. The next option is “Communities” which leads you to the registered communities by the user. Obviously there is a search bar at top to find the groups. Also users can check out the featured communities in the “more” tab. The next available option is the “People” tab which lists your buddy list. There is also an options available for account settings, profile, share etc in the “More” tab. This app really deserves a praise because of its communities option. Even in the private message itself once you send a message, you can find an option to add more people to the chat with a Plus symbol at the top right corner of the app. Users can add people from the contacts or by entering a name or number. When you receive a reply the app will notify it. In most of the third party apps, you won’t get notifications unless the app runs in the background (in iOS 4 ) or kept opened, but with iOS 3.0, you will be able to get those notifications as pushed! Also there is options for adding emotions to make texting more funny. Carriers supported on the textPlus app are: AT&T, Verizon, Sprint, T-Mobile, Alltel, US Cellular, Virgin Mobile, Nextel, Boost, CellularOne, Dobson, nTelos, Cellular South, and CellCo. Once you all set to text, textPlus is a good one to use. This well-done app pulls off group communication with ease and makes your messaging cool. Options for adding images will be a great deal for this app. We don’t have anything to talk about textPlus in particular, besides other competitors textPlus lacks a bit and need a little revamp of features to compete against its competitors. How do i get a document to my iPad from my computer? I typed it on the ipad, emailed it to myself, put finishing details on it, and now i want it back on my ipad but it wont send over email. So how do i file share it to the iPad? Well it’s good to see that you’re using proper grammar. Easily, the post is really the greatest on this precious topic. I harmonise with your conclusions and will certainly thirstily look forward to your incoming updates. Simply saying thanks will certainly not just be sufficient, for the extraordinary lucidity in your writing. I definitely will promptly grab your rss feed to stay abreast of any kind of updates. Genuine work and much success in your business endeavors!